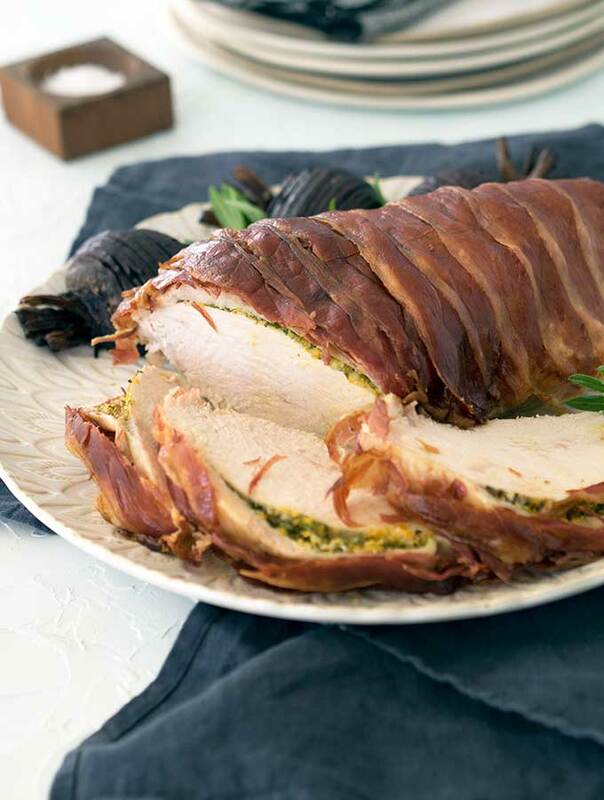 A brined turkey breast ensures this prosciutto wrapped turkey breast with tarragon citrus butter will be a flavour packed, tender and juicy centre attraction on your Christmas table. If your household is like mine, when it comes to turkey, breast is the king. Everyone wants a slice of turkey breast. Legs are often leftover, and just between us, the dog usually lucks out on a few turkey leg dinners. I stopped cooking whole turkeys years ago. Poor Harley hasn’t lucked out on turkey legs as yet, and unless specifically purchase for her, I doubt she will. I transitioned from cooking a whole turkey to a turkey buffe, a double turkey breast still on the bone. Imagine a whole turkey missing its legs, neck area and back. It’s a pretty impressive main dish. I then moved to turkey buffe off the bone. Which I found quite disgusting to work with. Slippery and slimy as all [email protected]#k to work with. It would take myself and a helping hand to stuff, roll and tie it. It left me feeling goopy and oogie from turkey “juices”. Goopy and oogie are words, trust me. After the whole ordeal I rarely felt like eating the turkey at dinner time. But my guests thoroughly enjoyed it. After tackling the boneless buffe a couple of years in a row, turkey didn’t make an appearance at my dinner table. There was no dinner table. We escaped it all and had a family Christmas and New Year in Fiji. Best …Christmas… Ever!!! I highly recommend everyone escapes Christmas at least once in their lives. The following year feeling refreshed from not dealing with turkey for a solid 24 months, I went the boneless single turkey breast route and haven’t looked back. The issue with cooking a turkey breast off the bone is it drying out. Last year I poached my turkey breast and it was delicious. This year I wanted to bake one, but have it still remain tender and juicy. This is where a brined turkey breast comes into play. A brined turkey breast is easier to handle than brining a whole turkey. Plus, if you are short on fridge space it is a great turkey portion option to brine. To further ensure that the brined turkey breast stays tender and juicy it gets another added layer of protection. This is in the form of stuffing the skin with copious amounts of tarragon citrus butter and then adding a protective layer of sliced prosciutto on top. Be careful when you are loosening the skin from the turkey breast. You want to keep it in one piece and still attached around the edges of the turkey. You are making a pocket with the skin to stuff the tarragon citrus butter into. 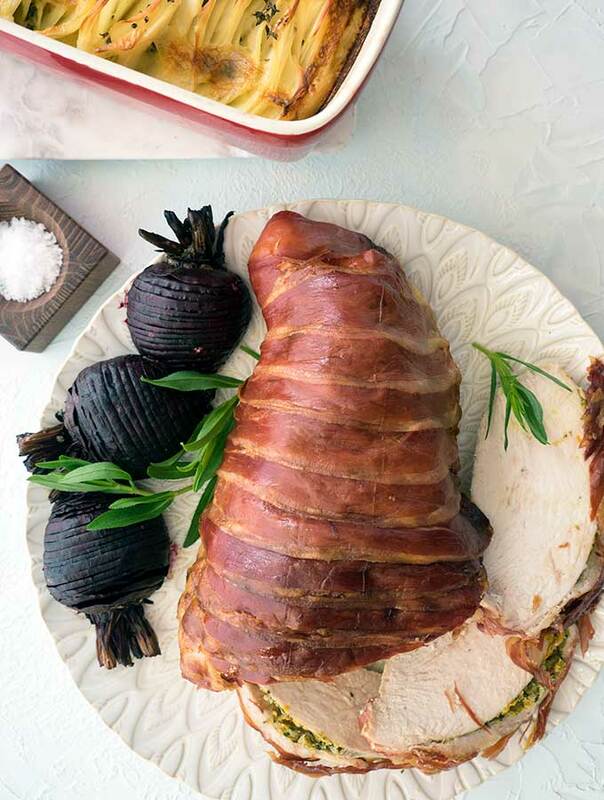 Before going ahead with this recipe make sure you have a suitable non-reactive container at home to brine the turkey breast. If you don’t pick that up when your order your turkey breast. Order your boneless turkey breast from your local butcher. I know I have order one as they don’t keep them in stock, not even at Christmas. Whole turkey and turkey buffe are still the popular choice in my area for Christmas. Don’t give the leftovers to the dog. Well you can if you want. Harley did enjoy some of this, shhhhh, don’t judge me. Store any leftover turkey in a zip lock bag with as much air removed as possible. It is great on sandwiches or eaten with salad. The beauty of a turkey breast is that there won’t be too much left over. Therefore you won’t get sick of turkey. 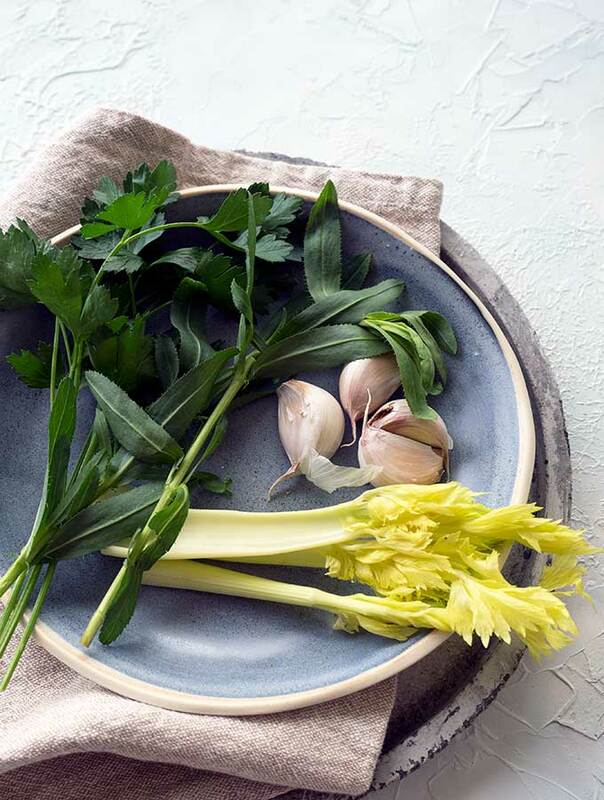 Place wine, 2 cups water, salt, brown sugar, garlic, tarragon, bay leaves and celery into a large saucepan. Over a high heat bring the mixture to a boil, stirring to dissolve the salt and sugar. Remove from the heat and add the extra 4 cups (1L) of water. Set to the side. Place turkey breast in non-reactive container (glass, plastic or stainless steel), big enough to fit the turkey breast, and high enough that li quid will be above to cover it. Pour brining solution over the turkey breast, make sure the turkey is covered in the brining solution. Cover the container and place in the fridge. Refrigerate for 2 -3 hours, but no longer. Just before removing the turkey from the brining solution make the tarragon and citrus butter. Place garlic, tarragon, orange rind, lemon rind, butter and salt in medium mixing bowl. Mix the ingredients until well combined and set aside. 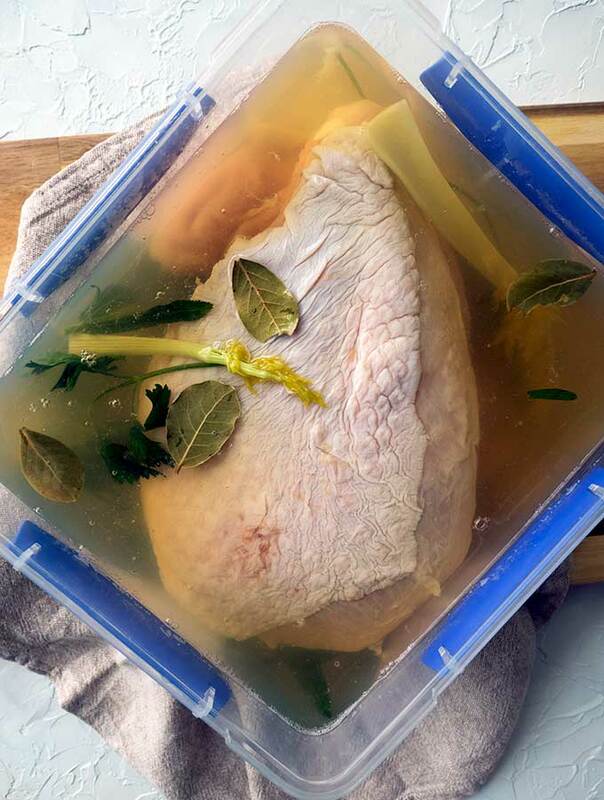 Remove turkey breast from brining solution and pat dry. Discard the brining solution. With care slide fingers between the turkey breast and the skin. Be careful and take your time as you do not want to break the skin. The idea is to keep the skin still attached the turkey breast around the edges, creating a pocket. Using your fingers push the tarragon and citrus butter under the skin. Smooth it out so the entire pocket under the turkey skill is evenly “buttered”. Place turkey in a large lined baking tray skin side up. Lay slices of prosciutto across the turkey breast, overlapping the slices slightly. 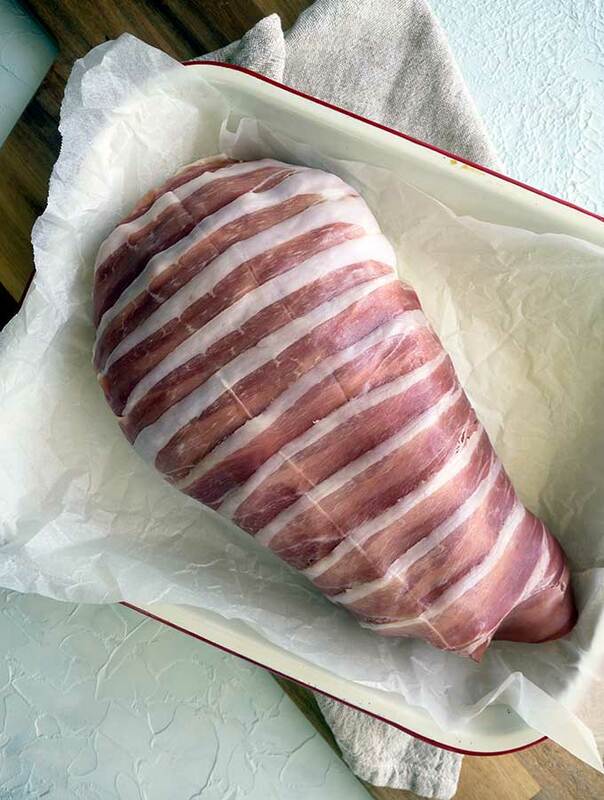 Tuck the ends of the prosciutto under the turkey breast. 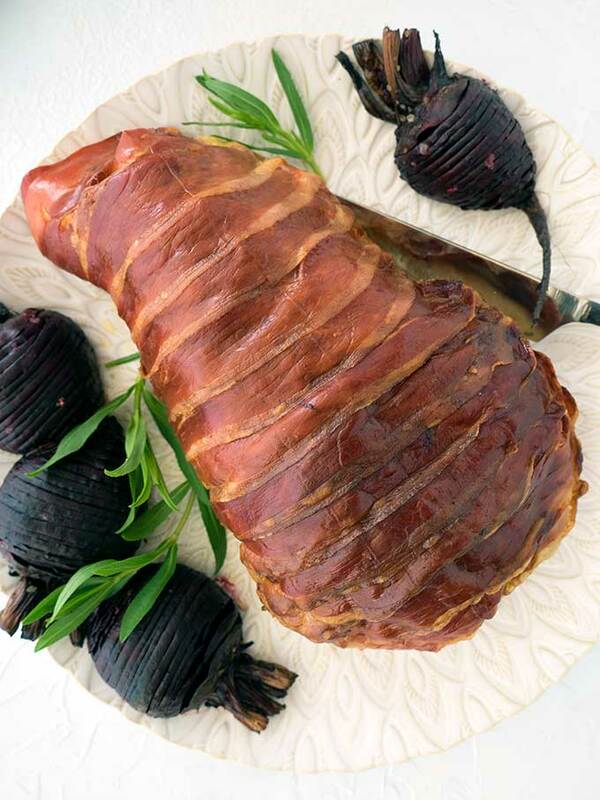 Place turkey breast in the oven and roast for 1 hour, baste with juices and butter during cooking. The turkey is ready when golden and the juices run clear when tested with a skewer. Once cooked remove from the oven, cover with aluminium foil and leave to rest for 20 minutes. To serve place on a serving plate. Slice a few thin slices, and then slice the rest at the table in front of your guests. Looks so delicious and perfect for a festive dinner! It is a great one for Christmas. What a beautiful idea was perfectly executed too. That prosciutto I bet makes this turkey breast so flavorful not to mention all the seasonings and garnishes. A true feast! Thnnks so much Adriana, the prosciutto really does add a flavour burst to the turkey. This is a great flavorful turkey breast!! 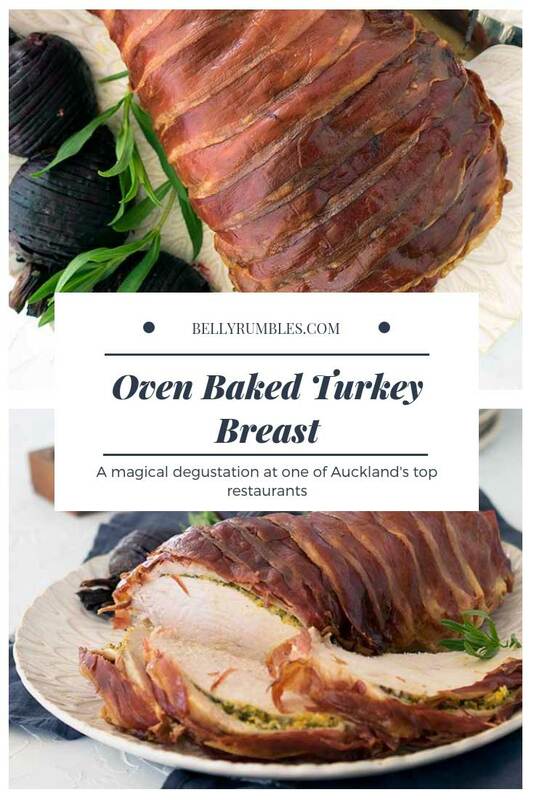 This sounds like a very luxurious way to make turkey for the holiday season. 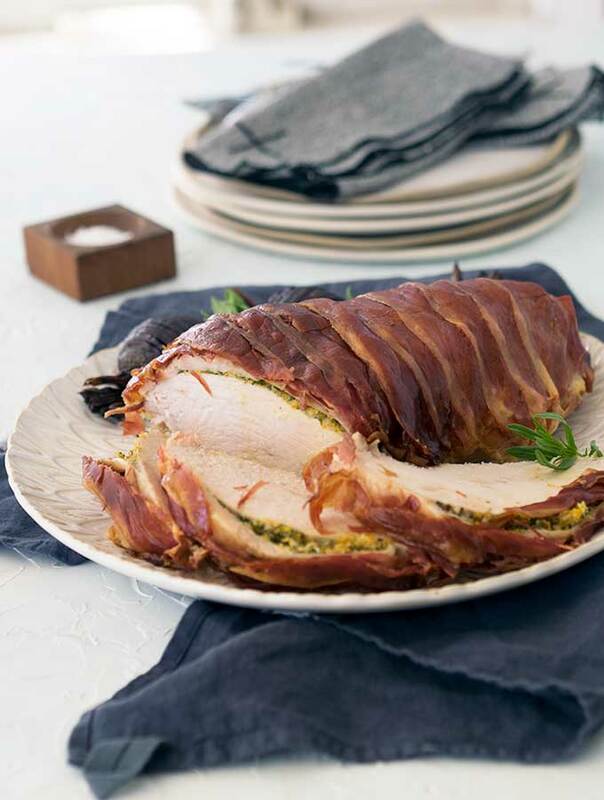 I love the idea of the salty and delicious prosciutto adding to the flavor of the turkey! The prosciutto really does add a lovely crisp salty crunch to the turkey. Thanks Jere, it was very tasty indeed.